Becca had hip surgery in January. I've been stalling to write this post until I felt like the whole ordeal was over. I think it's finally fair to say we're done with hip surgery, so here goes :-). It looks like this is going to be long, and probably not useful unless you're getting ready to go through the same thing yourself, in which case maybe you'll be glad it's thorough. 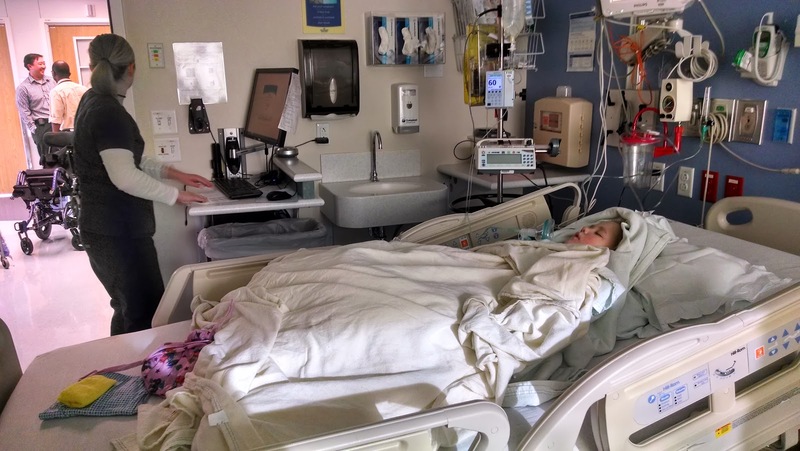 Over the Christmas holiday Becca started having seizures, a couple every day. We upped her dose of Trileptal and they started to go away, but then she was crying a ton and clearly in pain. We asked her where it was hurting and she said yes to her hips. Multiple times. 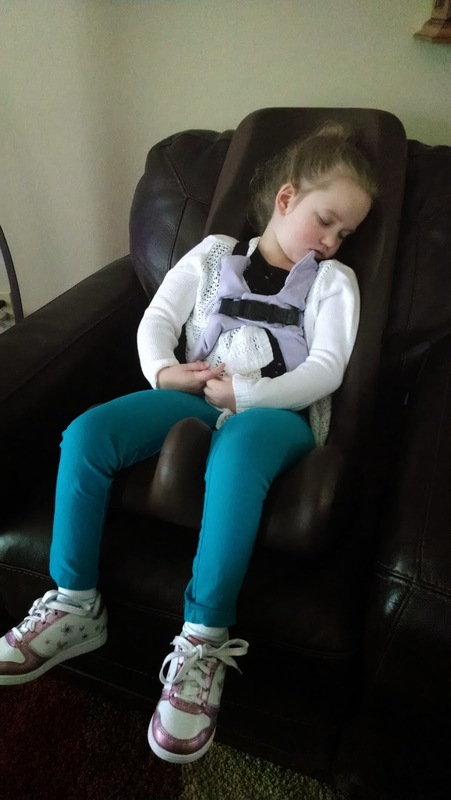 We tried every position we could think of, and after hours and hours she finally got comfortable sitting reclined in her feeding chair and fell asleep for a bit. Poor girl :-(. Becca's hips had been getting worse and worse over time, we already knew. Her condition was called "windswept" hips, which essentially means her comfortable resting position is with her hips shifted to the side. Since she doesn't stand or walk her hips didn't develop properly, in spite of a lot of attempts at therapy and "standing time". Her hips didn't develop the deepest sockets, and they were gradually tilting one direction. She always wanted to be turned that way, and it was getting worse and worse over time. Her left hip was coming out of socket every couple days and her hips would pop really loud when we lifted her sometimes or changed her diaper. We'd met with the Dr. Stevens in ortho and he'd said surgery was inevitable, just a question of when. We'd been hoping to make it until summer (read: not the sick season) but that obviously wasn't going to happen anymore. So we met with Dr. Stevens again to schedule it out. He explained the surgery again to us, a double osteotomy and adductor release. And another thing he never gave a name to. 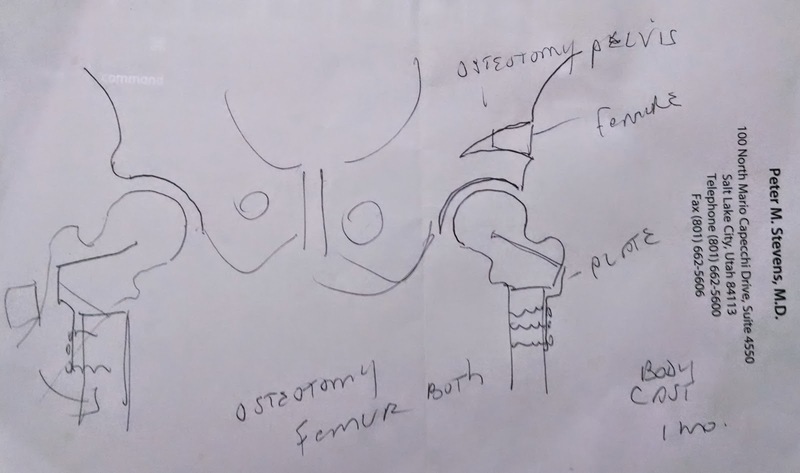 Basically he planned to cut off a piece of each femur to straighten them out, and he wanted to use one of those pieces to jam ("wedge") into the pelvis on the worse side to create more of a socket. Then he also wanted to loosen or release one of her groin tendons to "keep it loose" in the hopes that it won't pull everything off-balance again in the future. 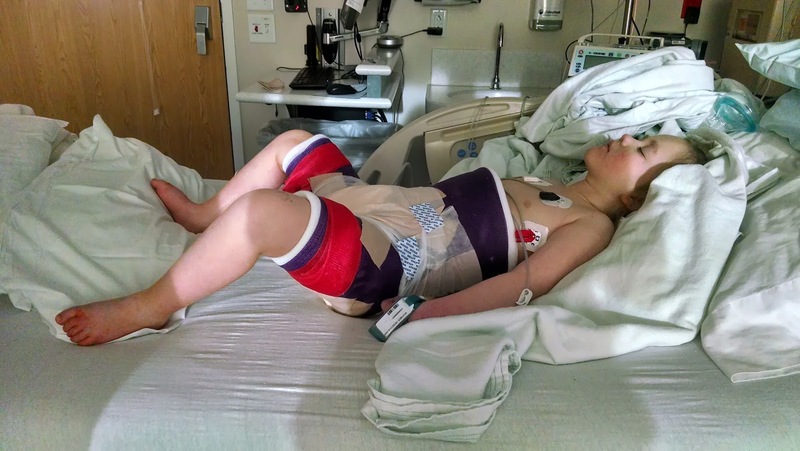 We'd seen some other families with a kid with Rett blog about their surgeries. One had these weird foam pads instead of a cast, we weren't sure if that would be a good idea or a bad idea for Becca. The nurses kept talking about having to rent a special car seat in order to transport her home. We actually ended up buying an accessible minivan which we'd been planning on doing anyway just not quite yet. That way she could ride home in her wheelchair which sounded a TON better than hoisting her into some weird carseat after bone-and-tendon-cutting surgery. We'd tried to the surgical team understand what a big deal the surgery was going to be for Becca but I don't think anyone really understood what we were saying. It's so easy for everyone to compartmentalize their work in a hospital -- the doctor just does his surgery, the anesthesiologist just does her drugs, the nurses just try to get you discharged, etc. Sometimes they seem to forget to think about what's best for the patient. We tried to tell a few people that we were pretty sure we were going to end up in PICU eventually, and after the last major surgery it kind of seemed like maybe we should just be starting there anyway, but nobody else was as concerned as us and this wasn't one we felt we needed to make a firm stand on, just a gut worry. There wasn't a whole lot to do leading up to the surgery, except get our other kids taken care of and assume we were going to end up the PICU again for at least a few weeks. Surgery day came, we brought her in, got her all gownified and everything. I guess someone had written that it was only one hip because the nurses kept asking and getting confused, but the doc came and settled everything. He talked about the cast for a minute and said, "she'll like a pink cast I assume." Paula was quick enough to turn to Becca and ask if she wanted a pink cast. Becca said a definite no (as in, "oh my gosh no"), so she started through colors and purple was the winner. Then on to the waiting room. We talked to the anesthesiologist about the surgery and Becca's past surgeries, we told him she's slow coming out of anesthesia and before has had a trouble breathing again afterward, but he didn't seem concerned. A couple people told us he's the best anesthesiologist in the hospital, so that made us feel a little better. A little. 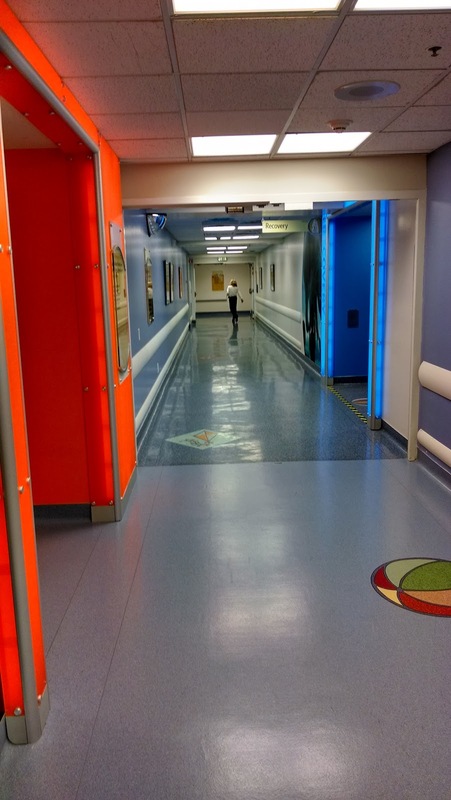 When you seem some random doctor wheeling your six year-old down the hallway to get knocked out, sliced open, cut up and sewn back together, there's not really such a thing as feeling better. On to the waiting room. At Primary's they're supposed to call every hour with updates during long surgeries but they're never that consistent, which is a good thing to know your first time, but we were used to that. We got a couple called during the five hours of surgery and recovery, but I don't think we were really expecting a crisis during surgery (those come later), so we were holding on to our tension regardless. It probably didn't help that the doctor came to speak to me after the surgery (Paula was in the bathroom so it was just me) and assured me the surgery went great and Becca was all wrapped up in her pink cast (pink?!). Though we did have a diverting adventure in our fellow waiting-room-ites. There was an older woman with two teenagers who were all dressed very... conservatively? Like, Amish-style clothes. We chatted with them a little but the younger girls wouldn't say anything and the older woman wasn't terribly friendly. Finally I asked where they were from and she said "Hildale" in an "obviously" sort of tone. When I said I had no idea where that was she got a little friendlier. I mean, they had a rural Utah accent, but they seemed nice enough. Anyway, when they left for a little bit I looked up Hildale, Utah on my phone. That explained a lot. We chatted with them a bit more when they got back, the older woman didn't come back and the younger girls were much chattier without their chaperone. We had a good talk until I asked where their dad worked. They said, he's a missionary. Which piqued my interest so I asked more. They said they hadn't seem him in years. I said that must be hard and they flatly said it was worth it for the Lord's work. Anyway, they were interesting company. Finally it was time for someone to go back and wait in recovery with Becca. I went back because I'd done it a couple times now and am probably a little more assertive than Paula if something needs to get done -- well, I guess that used to be true. Not sure if it still is, actually. Paula can be a tiger mom these days, it's pretty awesome. Anyway, I went back with Becca. I got to her bed and the nurse was on her computer looking at the Wikipedia page for Rett Syndrome :-). She asked me if Becca has seizures and I took the opportunity to catch her up on Becca specifically and Rett in general, making sure to cover the places where Becca differs from Wikipedia. Just a recovery nurse, but you never know when you're going to have an emergency, so I gave her the long story. We waited for a good hour for Becca to start to wake up (which is typical for her, a little long I think for the nurses), then the nurse called upstairs (downstairs? I can't remember) and recounted my history of the Becca to the floor nurse. At this point Becca's in and out. She's got an epidural and blow-by oxygen, and she's obviously not enjoying life, but she's being a good sport I think. Also she's in a purple cast, not pink, which I quickly text to Paula who has been trying to figure out damage control for the last hour over that one. We wheel her to the elevator (elevators are super-freaky post-op. 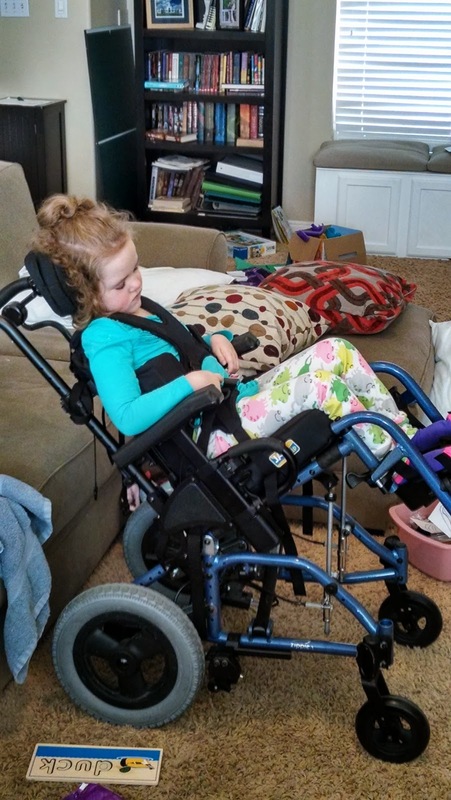 It's like the one place in the hospital where things can potentially go really bad really fast, so they pile on the battery-operated equipment for those trips) head to her room and then get transferred to another room before we can drop our stuff. This new room has, awesomely enough, a room adjacent where some nurse is putting on a spacesuit before entering. Seriously? Do they just clump all the high-maintenance cases into one corner or something? Paula and I both unconsciously held our breath every time we entered or left Becca's room. Cool, so now we're admitted. Every time Becca wakes up she just says "no no no" over and over to anything we ask her. Obviously she's not happy on multiple levels. But she's not coughing and she's breathing really well so we're not complaining. The pain management team shows up to talk to us and make it pretty clear they want to do everything they can to get that epidural out as soon as possible. 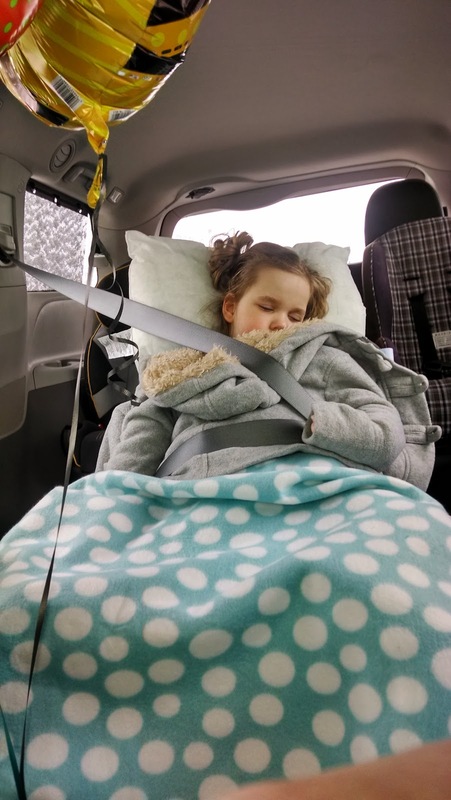 We're in no rush, thank you very much, but this group is probably the worst during our stay at thinking of Becca, and it becomes increasingly apparent that they want to get this child off their list much more than they want to correctly manage her pain. Maybe that's unfair, but that's how it felt. Our friends from the Rainbow Group also stopped by. This is the group that shows up when your child only has a few days left to live (or when your child has a permanent major disability like Rett, though I'm sure you can imagine why we're not friends) to make things as not-miserable as can be hoped for. Usually we just blow them off but I mentioned that Becca likes music and they latched on to that and said they'd find the music therapist -- who unfortunately came when Becca was sleeping, but it was a nice gesture at least. Doc stopped by to check on his work. He is so funny. He has a terrible bedside manner, but he seems very capable at what he does so we're ok with that. He kept commenting on just how great the surgery went. We asked if there was anything we needed to keep an eye on, any risks we should be aware of. He said "well no" as in "obviously not on one of *my* surgeries". It was funny. But like I said, I don't mind a cocky doc, as long as they're good. He also made sure to show us the "bump" he left in the body cast so we'd be able to reach down and access the feeding tube. More on that later. Ok, more on that now. They assured us Becca would swell up from the surgery, in spite of all the ice packs and medicine. Sure enough, she did pretty quickly. And that cute little bump for the feeding tube soon wasn't even loose enough to stick a finger into. I managed to squish my hand in and push her stomach in hard enough to get a feeding tube clipped in but this obviously wasn't going to be a good solution. The next day one of doc's residents came and cut out a square using a small circular saw. There was a lot of blood under there from where the mick-key button had obviously been pressed hard against her stomach, but nothing permanently messed up at least. If I could give anyone advice going into a surgery like this, it would be to make sure they cut a space in the cast for the feeding tube. And it needs to be a big one, that tube will move two to three inches up and down during the recovery process. Not sure if this is common knowledge everywhere else, but we never got the memo. After two days Becca was still in a lot of pain but the pain management team was determined to get the epidural out. We were headed out for lunch (grandma and grandpa were with Becca) when we happened to see them heading to the room. They said they were coming to pull out the epidural. Lunch was cancelled, obviously. We talked a long time to them about when was the best time to remove the epidural. They'd turned off flow to the epidural like an hour or two earlier, and we didn't think that was enough time to know how Becca would handle the pain. They assured us we'd have to take the epidural out the next day anyway. I asked how much of a difference another day would make and they admitted sometimes it could make a big difference, but they were still pressuring us a lot to take it out right then. We ended up giving in, unfortunately. That night was terrible. Neither Paula nor I ever felt comfortable leaving at night, even though my parents lived fifteen minutes from the hospital and had an extra bed. Not after last time. So we'd been sharing one of those fold-out couches. It was probably comical for the nurses to watch us sleep, but whatever. Anyway, that night it didn't matter that we didn't have a bed, we were taking shifts staying up with Becca. Lots more coughing which was triggering lots of bad memories, but she was keeping her oxygen level up in spite of her crazy-high heart rate and obvious pain every time the nurses moved her. The next day when it was clear Becca was still in a TON of pain we started trying new medicines. 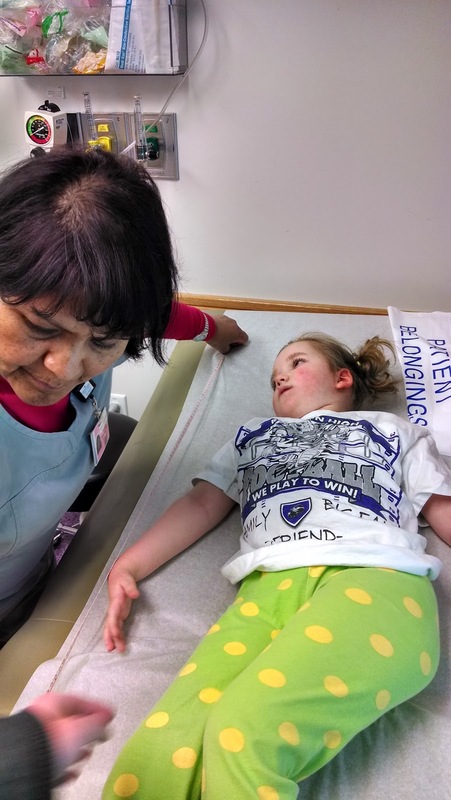 We'd told everyone that Becca has a high tolerance for pain, so the fact that she wasn't crying or screaming didn't mean she wasn't in a lot of pain. Conveniently enough the pain management team no longer felt the need to visit us or be involved, so the nurses were just trying stuff. We ended up on a narcotic (oxycodone) that she hadn't tried before so we didn't know if we should hate it or not :-). That night her breathing consistently got shallower and shallower, less and less frequent. It was a hard spot to be because at least she was sleeping, but when she got down to 10 breaths per minute then we were nervous. We could keep her oxygen saturation up with the breathing mask on her face, but yeah. The nurse was also very nervous, and finally called up the charge nurse. We told them some drugs have built up in her system in the past, and they said that's common with narcotics in general (why aren't these things on her chart?). The charge nurse wasn't comfortable with the levels, so she wanted to give Becca something called a reversal. I guess it temporarily binds to the narcotic and immediately stops it doings its thing (like, immediately). So they gave that to her and sure enough, she woke up before they'd pulled out the syringe and started coughing and trying to throw up. Crying and yelling, in tons of pain. That was hard to watch, and not just for us. 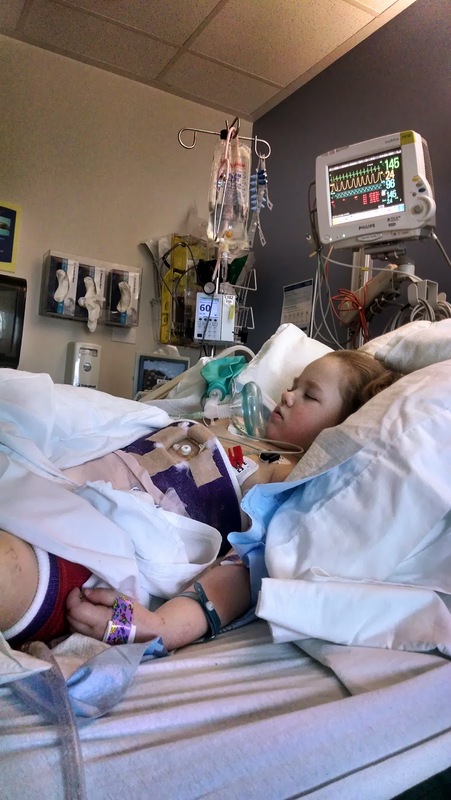 They called someone up from PICU to get some input, and they really wanted to give Becca a different narcotic since she was obviously in a lot of pain. We butted in at this point and asked if since the reversal was only temporary, once it wore off wouldn't Becca go back into the sedative state, and maybe it would be a bad idea to give her yet another breathing suppressant. 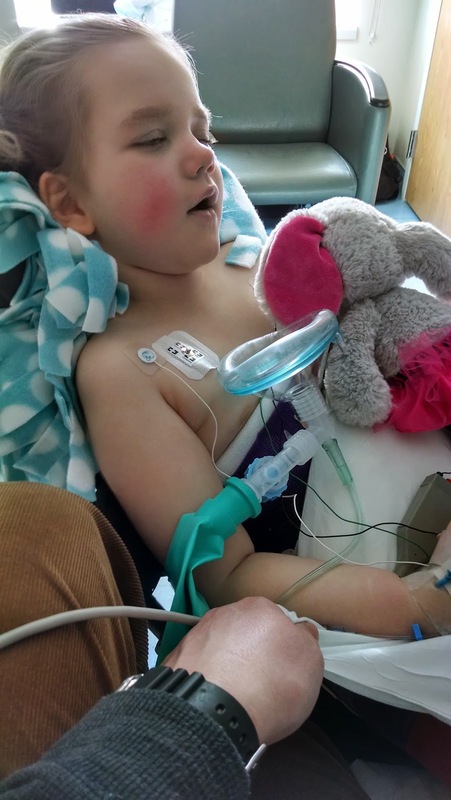 The PICU doctor agreed with us and told us we could either bring her to PICU or try to balance her pain (he wanted to make sure we knew there would definitely be pain, which was nice of him) and breathing with a lot of attention from the nurse. The nurse said she was up for it (she was one of our favorites), and we reminded everyone that we'd said multiple times that we didn't need Becca to be in *no* pain, we could work through some pain with her. 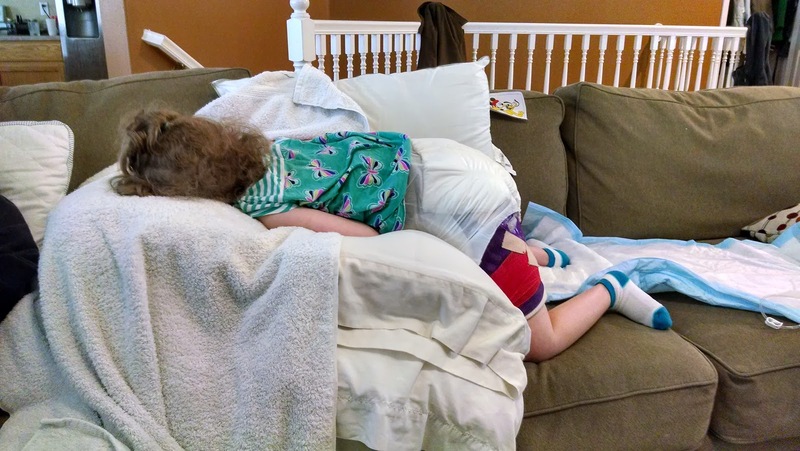 I can understand why some parents can't handle their kids being in any pain, I really can, but we're kind of used to watching Becca struggle. Once the oxycodone was on its way out of her system we started a low dose of Lortab, low enough that it shouldn't build up in her system. Also pretty funny how they kept checking Becca's heels to make sure they weren't developing any sores. Her bum wasn't terribly accessible, but man oh man were they diligent and checking those heels. After another day Becca wasn't really doing better, but she did seem stable at least. Even the nurses wanted us out of there. They started talking about the medicines we'd be switching to when we got home... wait, what? We'd had enough happenings at this point that assertive parenting mode had definitely kicked in, and we told them we weren't leaving until we'd been 24 hours on the same medicine and doses she'd be getting at home. They weren't super happy about it, but they said ok.
Driving home, holy cow there are a lot of bumps on the road. Becca would cry out often on the drive home. We felt so bad. Taking care of the cast was miserable. Get moleskin or duct tape around the the edges of the cast as quickly as possible, it all gets really messy and sweaty. We'd put a small diaper inside a large diaper, but that didn't catch everything. Also, being permanently in a semi-reclined position is better than being flat I suppose, but it still took lots of pillows and repositioning to keep her comfortable. What we wouldn't have given for an adjustable bed. We were rotating between tylenol and ibuprofen and if we weren't faithfully on schedule then it was obvious, and Becca would start crying. Also, we were lucky enough to share a cough and stomach bug or something at our house after we got home, so then Becca had coughing fits to deal with as well. The silver lining was that we had to move Becca a lot more often for all the diaper changes, but it definitely wasn't fun. It takes Becca a long time to get over sicknesses in general, so with that on top of the surgery we definitely got to an exhausted emotional place. Lots of praying and hoping for things to get better while just trying to push through and make it through the day without crashing. A few weeks later when they cut the cast off, we were so glad to be done with it. When they pulled it off Becca started crying her in-pain cry. We expected as much. The doctor assured us that she wasn't actually feeling any pain, she was just apprehensive because she didn't have the security of her cast anymore. We both looked at him like, "oh really". We know Becca's cries and that wasn't an apprehensive cry. Anyway, she calmed down once we'd had her in a sitting position for a few minutes. I'd love to say once the cast was off everything was roses. But she still couldn't lay flat without being in pain. She needed a pillow under her knees for weeks afterward. We still prop her up under her legs at bedtime because it seems a little more comfortable. And it took a few weeks before we could get her in her stander higher than a thirty degree incline, but we eventually got there. Now we seem about as good as we're going to get. She still gets stiff sometimes, and her hip pops every once in a while (not as loud as it used to), but she's way more balanced between sides, and she does great in both her chair on lying down. All in all I'd say the surgery was a success, in spite of how miserable it was. As long as we don't have to do it again any time soon :-).